If you’ve always dreamed of exploring Morocco, you may not know where to start. After all, Morocco is a country for those seeking to reconnect with nature, relax by a pool, or dive into bustling markets alike. However, anyone planning a trip to Morocco needs to consider adding the Atlas Mountains to their itinerary. The Atlas Mountains are actually a series of mountain ranges. These peaks extend across Morocco, Algeria, and Tunisia, and hiking or trekking in them is a treat, no matter what your experience or ability. Exploring this area means everything from hiking steep cliffs to wandering alongside streams and rivers. Those adventurers lucky enough to explore this region in Morocco have the opportunity to climb to the Atlas Mountains’ highest peak: Toubkal. Located in Toubkal National Park, the highest point reaches a height of 4,167 metres. Climb with assistance from local porters, join a group tour, or attempt to discover the Atlas Mountains on your own. The satisfaction of reaching the top is almost as incredible as the views you’ll find there. The area surrounding Morocco’s Atlas Mountains includes the Sahara Desert: not to be missed by anyone travelling to Morocco. Explore the area on foot, or, if you’re feeling daring, try a guided camel ride and do things the old-fashioned way. It’s a must for anyone who’s ever dreamed of visiting this north-African gem. 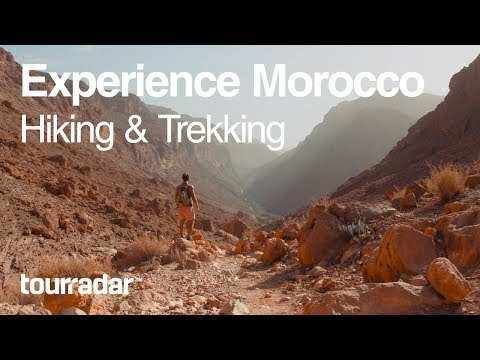 If Morocco is next on your list, or even if you’re just dreaming of endless desert and gorgeous views, we hope this video can give you a bit of a taste of what Morocco’s Atlas Mountains have to offer. If you simply can’t wait to explore these historic and gorgeous cities, you know what to do: it’s time to plan your trip to Morocco.